I am still in puppy-love. Here's MAC. After he got a bath and a brush on Thursday. He is still the cute-est dog ever and our whole family totally loves him. Since wednesday the dance festival is in full force + all 3 my girls have a cold. But I must say this is the way character is being built. We just will not quit. It only wraps up for us on Sunday. Tomorrow is Kirstin's birthday party. and on top of it all i am emerged in HTML code preparing for my blog class. Well, not so much the HTML code as making videos + screen shots. This blog class is something that's been coming for a long time. I am happy to be putting it together at last. If you want to register, this is the time to do it! It's really really comprehensive and if you feel your blog needs a spring clean... maybe a new template and some cute titles like my blog, then click quickly and register. For the blogger class, you HAVE to be able to watch videos like this one where KA is explaining all you need to know for the class: If you can watch this video, then the class will be pleasure and not a frustration! Most of my lessons have some screenshots too, but explaining something in a video is just so much easier! so a thought for today: Heb 4: 12-13God means what he says. What he says goes. His powerful Word is sharp as a surgeon's scalpel, cutting through everything, whether doubt or defense, laying us open to listen and obey. Nothing and no one is impervious to God's Word. We can't get away from it—no matter what. That Mac may be the cutest puppy ever! What a sweetie. Are you going to teach us how to set up three column format if we want that? I love the look of your blog. And your dog too...he's adorable. Not a hair out of place; what a good puppy! Have a great weekend...can't wait til Monday! I would LOVE to win a spot in your class...and I would LOVE to learn to create fonts and make my blog layout look like a scrapbook page! 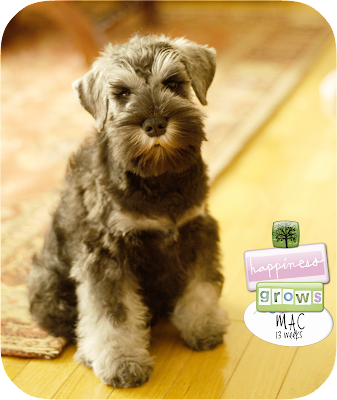 Mac is adorable...today was "puppy play day" for my little schnauzer...he's one tired puppy at the moment (so is mommy). Sweet little dogs, aren't they? I'd LOVE to learn how to make the little widgets/buttons for the sidebars! So fun! I would love to learn how to add my own handwriting and how to make 3 columns. I would love to learn how to add all the pretty details, you have so much eye candy all over for th e eyes to feast upon. I'd love to be able to have a 3 column site. And pretty post titles too :). Hope your girls feel better by their final performances. You're teaching them the right thing. Better continue doing something they love instead of sitting at home missing out and still feeling bad. (And such a good Mom for keeping them home to heal and be pampered the other day. Perfect mix). MAC is soooooo precious!!! He made me smile!!! And, that family of yours is so cute! Thanks - I really enjoy your blog and your enthusiasm. I have a decent knowledge of computers but have yet to do much about my blog. I use it only for work, as a high school teacher I thought it would be fun to put little bits and pieces of the happenings of my classroom for the students and their parents. But it was more than I can keep up with as my knowledge is not great. I can't even figure out how to get music on there, which is what I really wanted to do. This looks SO useful! I have a bit of knowledge here and a bit there so I would love to take this class to bring that all together to turn my blog into a masterpiece! I really want to learn to do a three column format and then add some things like navigation and other things. I would love to learn more on how to customize my blog. Sounds like a great class! Fun I seriously love your blog, and I have a lot to learn! Thanks for the constant inspo!